Previously, we created linen card logo mockup & bronze foil printed logo mockup PSD. 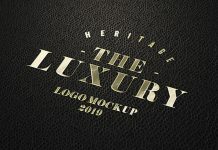 Today we are glad to showcase yet another high quality free embossed logo mockup for our audience. Place your logo mark, logo design or logotype on smart layer and get a beautiful embossed fancy card effect. Easily change the color of the fancy card by applying fill color and also place any custom background according to your liking. 2. Layers are hidden to minimize the size of the file kindly unhide or ungroup.